With too many commitments and too little time, I nearly missed the deadline for the competition quilts submission for the Festival of Quilts this year! Prints from Art Gallery Fabrics and Liberty. Three amazingly talented quilters - Jo Avery (@mybearpaw), Jenny Haynes(@peppersaxsten) and Sheila Scott - have submitted their quilts to the FOQ where I had an honour and a priviledge to longarm quilt their beautiful quilts! It was not easy to take photos of it due to its size - hence I dusted off my blog and uploaded large pictures here for those who would want to see the details! I love to hover over the details when looking at other people's quilts. :-) Click on the photo to open it in the original size. For the brave quilters who would consider tackling this piece, here is a link to this quilt pattern. The last but not the least - a collection of the QuiltCon2017 quilts that made it to the competition through a tough selection process - to be displayed at International Trade and Convention Centre in Savannah! There were more stunning works - including mini quilts and young quilters - displayed, and I am sure other bloggers have photos of those. All I want to say is I truly admire desire, passion and determination of women from around the world to create art. Often combining it with full-time jobs and looking after the families. Hi! :) Thank you for visiting my blog. 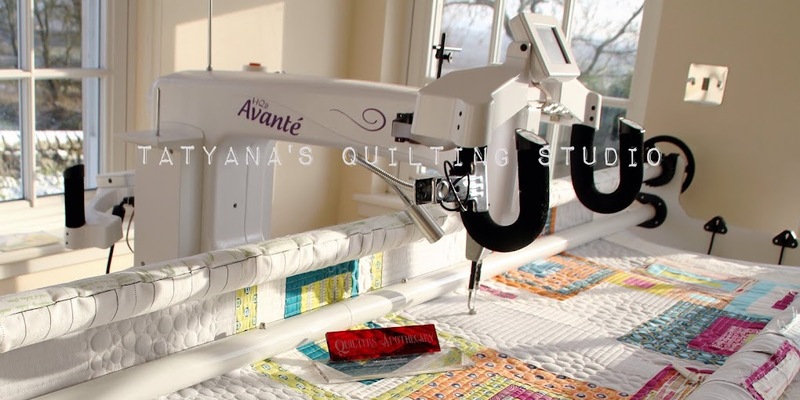 I am passionate about longarm quilting and love to share my work. The best reward for me is to see my customers happy when they pick up their completed quilts! Please e-mail to me to discuss your quilting needs.